Silent sinus syndrome (SSS) is a rare condition that causes facial asymmetry, unilateral painless enophthalmos, orbital floor collapse, and diplopia, which represent the chronic maxillary sinus atelectasis with chronic negative pressure within the sinus. SSS is also known as imploding antrum. Some believe that congenital development of the maxillary sinus may also be responsible for the development of SSS. Its characteristic imaging features are maxillary sinus outlet obstruction, sinus opacification, and volume loss caused by inward retraction of the sinus wall. Ostium obstruction appears to play a critical role in the development of SSS. Treatment involves reconstructive procedure of orbital floor and functional endoscopic sinus surgery. Silent sinus syndrome (SSS) was described by Montgomery, but the name was given 30 years later by Soparkar et al., SSS is chracterised as painless involution of maxillary infundibulum;associated enophthalmos differentes syndrome. Condition always presents to be unilateral and affects the third and fifth decade of an adult patient. The presenting symptom is spontaneous. One side enophthalmos slightly over the course of several months, even rare case of sudden onset are also described. The term imploding antrum is another term used for SSS. Recently, in 2008, Brandt and Wright required SSS to be included under the common term chronic maxillary atelectasis. Ocular manifestations are asymmetry due to exophthalmos in uninvolved contralateral eye or enophthalmos or ptosis of the affected eye. No histories of rhinosinusitis or significant sinus symptoms are evident. An orbital/paranasal sinus view in computerized tomography (CT) and magnetic resonance imaging (MRI) demonstrates opacification and collapse of orbit floor. The etiology of SSS is not unclearly understood. Several theories have been proposed to explain the cascade of event. The most popular theory suggested by several authors,,,,,,, is that hypoventilation of the maxillary sinus secondary to obstruction of ostium leads to the formation of chronic negative pressure. Several mechanisms of ostial occlusion propose that occlusion by persistent mucoid impaction, hypermobile infundibular wall or lateralized middle turbinate, mucocele or nasal polyp results in occluding of ostium or antrum. In the presence or absence of sinusitis, the inflamed mucosa of hypoplastic maxillary sinus and antrum causes decreased ostial width, resulting in more frequent occurrence of occlusion. The hypoventilation and occlusion of the sinus may lead to the development of negative pressure. This negative pressure may cause thinning and serious structural damage to sinus walls, including the orbital floor, leading to hypoglobus. In case of opening of maxillary ostium, the sinus fluid, which initially provided support for the thin orbital floor, may drain, resulting in further depression of the globe and orbital floor. Secondary enophthalmos after bone removing orbital decompression, the severe nasal inflammation with marked expansion, and pressure of altered turbinate may cause prolonged impairment of antral drainage. Subatmospheric pressure associated with retained secretions causes the implosion. Patients present to an ophthalmologist for evaluation of a change in facial appearance, either with the “sunken eye” appearance or deepening of sulcus of the upper lid or with discomfort of an intermittent vague around the affected orbits., The most common findings in all the patients with SSS are nasal mucosal lining with mild or normal inflammation, enlargement of middle meatus, and uncinate process completely adherent to the lateral wall causing the obstruction of maxillary natural ostium. Along the ethmoid-maxillary drainage pathway, no pathologic secretion is present. Management of SSS is mainly by two steps: (a) clearing the sinus and recontouring a functional drainage passage and (b) reconstructing the normal orbital architecture. Most authors suggested a Caldwell–Luc procedure or functional endoscopic sinus surgery (FESS) as an initial treatment followed by the reconstructive procedure with the placement of titanium mesh, autogenous nasal septal cartilage, spilt-thickness bone, or auricular concha cartilage onto the floor of the orbit.,,,,,,, Some suggest, inferior displacement of orbital floor is self-reversed and remodeling occurs.,, In some patients, the FESS alone can minimize the enophthalmos. The progression of diseases has been arrested without any further deformity of sinus after FESS. Endoscopic antrostomy in combination with orbital floor repair – a single-stage procedure – is preferred when severe enophthalmos is present.,, Reduced morbidity, reduced patient discomfort, and less time of hospitalization are advantages of single-stage procedure. Postoperative complications including implant impact infection, postoperative diplopia, vision loss, or hematoma are much lower in the case of single-stage procedure., Common material of choice for floor reconstruction of SSS are Medpor implant, silicone blocks, and Teflon sheets. Using silicon blocks, the size and shape of the silicon should be evenly distributed on the adjacent healthy bone without causing any pressure. In 2011, nonsurgical approach using hyaluronic acid gel to correct enophthalmos after middle–meatal antrostomy was reported. SSS is a rare condition and often misdiagnosed with controversial pathology. The diagnosis is concluded after the complete study of imaging. There is the need for all clinicians exposed to head and neck pathology to be familiar with SSS to ensure the correct diagnosis is made and optimal treatment is provided. Treatment of disease consists of restoration of maxillary sinus aeration and reconstruction of the orbital floor in case needed. Dumitrescu D, FănuŢă B, Stepan AE, Fronie AI, Dumitrescu CI, MârŢu MC, et al. Silent sinus syndrome – Report of a case. Rom J Morphol Embryol 2015;56:229-37. Soparkar CN, Patrinely JR, Cuaycong MJ, Dailey RA, Kersten RC, Rubin PA, et al. The silent sinus syndrome. A cause of spontaneous enophthalmos. Ophthalmology 1994;101:772-8. Numa WA, Desai U, Gold DR, Heher KL, Annino DJ. Silent sinus syndrome: A case presentation and comprehensive review of all 84 reported cases. Ann Otol Rhinol Laryngol 2005;114:688-94. Castelein S, Cohen M, Ayache D, Klap P. Atelectasis of the maxillary sinus: Report of a case of acute onset. Rev Laryngol Otol Rhinol (Bord) 2002;123:99-102. Stevens K, Omer S, Toocaram B, Rich P, Almemar A. The imploding antrum syndrome: An unusual cause of double vision. Pract Neurol 2010;10:101-4. Cobb AR, Murthy R, Cousin GC, El-Rasheed A, Toma A, Uddin J, et al. Silent sinus syndrome. Br J Oral Maxillofac Surg 2012;50:e81-5. Monos T, Levy J, Lifshitz T, Puterman M. The silent sinus syndrome. Isr Med Assoc J 2005;7:333-5. Rose GE, Sandy C, Hallberg L, Moseley I. Clinical and radiologic characteristics of the imploding antrum, or “silent sinus,” syndrome. Ophthalmology 2003;110:811-8. Buono LM. The silent sinus syndrome: Maxillary sinus atelectasis with enophthalmos and hypoglobus. Curr Opin Ophthalmol 2004;15:486-9. Illner A, Davidson HC, Harnsberger HR, Hoffman J. The silent sinus syndrome: Clinical and radiographic findings. AJR Am J Roentgenol 2002;178:503-6. Kass ES, Salman S, Rubin PA, Weber AL, Montgomery WW. Chronic maxillary atelectasis. Ann Otol Rhinol Laryngol 1997;106:109-16. Boyd JH, Yaffee K, Holds J. Maxillary sinus atelectasis with enophthalmos. Ann Otol Rhinol Laryngol 1998;107:34-9. 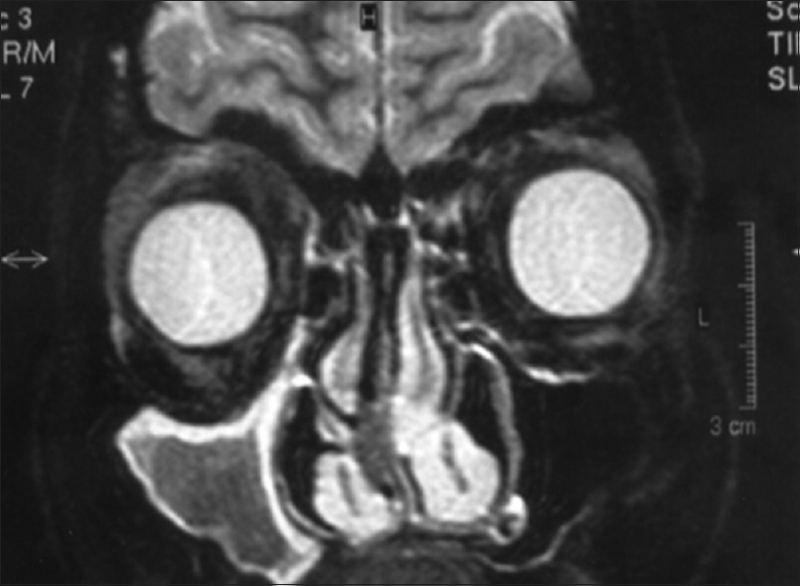 Gillman GS, Schaitkin BM, May M. Asymptomatic enophthalmos: The silent sinus syndrome. Am J Rhinol 1999;13:459-62. Blackwell KE, Goldberg RA, Calcaterra TC. Atelectasis of the maxillary sinus with enophthalmos and midface depression. Ann Otol Rhinol Laryngol 1993;102:429-32. Antonelli PJ, Duvall AJ 3rd, Teitelbaum SL. Maxillary sinus atelectasis. Ann Otol Rhinol Laryngol 1992;101:977-81. Rose GE, Lund VJ. Clinical features and treatment of late enophthalmos after orbital decompression: A condition suggesting cause for idiopathic “imploding antrum” (silent sinus) syndrome. Ophthalmology 2003;110:819-26. Vander Meer JB, Harris G, Toohill RJ, Smith TL. The silent sinus syndrome: A case series and literature review. Laryngoscope 2001;111:975-8. Wan MK, Francis IC, Carter PR, Griffits R, van Rooijen ML, Coroneo MT, et al. The spectrum of presentation of silent sinus syndrome. J Neuroophthalmol 2000;20:207-12. Bossolesi P. Silent sinus syndrome: Clinical findings and differential diagnosis. Case Rep Clin Med 2014;3:293-303. Roach HD, Shuttleworth GN, Powell N. A case of unilateral enophthalmos. Br J Radiol 2003;76:577-8. Burroughs JR, Hernández Cospín JR, Soparkar CN, Patrinely JR. Misdiagnosis of silent sinus syndrome. Ophthalmic Plast Reconstr Surg 2003;19:449-54. Soparkar CN, Patrinely JR, Davidson JK. Silent sinus syndrome-new perspectives? Ophthalmology 2004;111:414-5. Montgomery WW. Mucocele of the maxillary sinus causing enophthalmos. Eye Ear Nose Throat Mon 1964;43:41-4. Hunt SM, Tami TA. Sinusitis-induced enophthalmos: The silent sinus syndrome. Ear Nose Throat J 2000;79:576, 579-81, 584. Dailey RA, Cohen JI. Surgical repair of the silent sinus syndrome. Ophthalmic Plast Reconstr Surg 1995;11:261-8. Kim SA, Mathog RH. Radiology quiz case 2. Silent sinus syndrome: Maxillary sinus atelectasis with enophthalmos. Arch Otolaryngol Head Neck Surg 2002;128:81, 83. Brandt MG, Wright ED. The silent sinus syndrome is a form of chronic maxillary atelectasis: A systematic review of all reported cases. Am J Rhinol 2008;22:68-73. Babar-Craig H, Kayhanian H, De Silva DJ, Rose GE, Lund VJ. Spontaneous silent sinus syndrome (imploding antrum syndrome): Case series of 16 patients. Rhinology 2011;49:315-7. Thomas RD, Graham SM, Carter KD, Nerad JA. Management of the orbital floor in silent sinus syndrome. Am J Rhinol 2003;17:97-100. Sesenna E, Oretti G, Anghinoni ML, Ferri A. Simultaneous management of the enophthalmos and sinus pathology in silent sinus syndrome: A report of three cases. J Craniomaxillofac Surg 2010;38:469-72. Behbehani R, Vacareza N, Bilyk JR, Rubin PA, Pribitkin EA. Simultaneous endoscopic antrostomy and orbital reconstruction in silent sinus syndrome. Orbit 2006;25:97-101. Iseli HP, Hafezi F, Mojon DS. 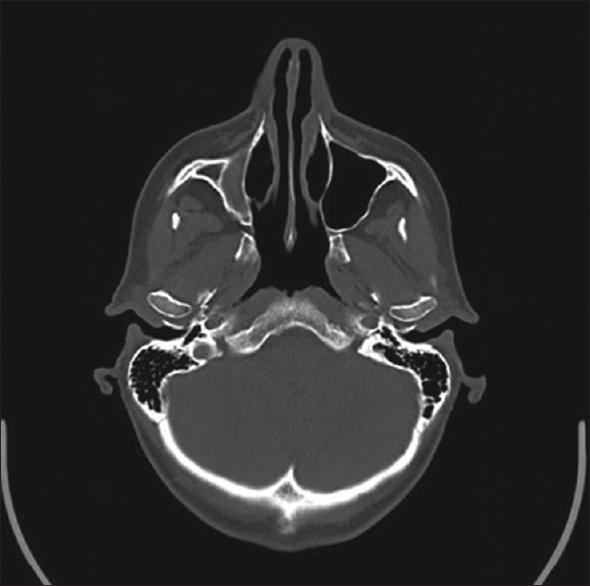 Conservative treatment of vertical diplopia in a patient with silent sinus syndrome. Ophthalmologica 2003;217:308-9. Rose GE. Silent sinus syndrome – New perspective? Author reply. Ophthalmology (Rochester, Minn) 2004;111:415-6. Mavrikakis I, Detorakis ET, Yiotakis I, Kandiloros D. Nonsurgical management of silent sinus syndrome with hyaluronic acid gel. Ophthalmic Plast Reconstr Surg 2012;28:e6-7. Bolger WE, Woodruff WW Jr., Morehead J, Parsons DS. Maxillary sinus hypoplasia: Classification and description of associated uncinate process hypoplasia. Otolaryngol Head Neck Surg 1990;103:759-65.